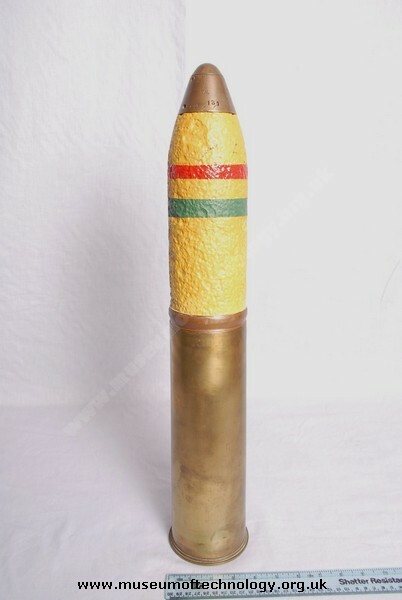 High explosive 18 pound round with No 100 impact fuze of 1915. The No100 fuze was replaced by the No101 type which had improved safety features. for more information see Item A0467. One of these was brought back from the first world war as a souvenir and kept on the hearth of one of my old relatives, clean and polished for many years. A gas man called many years later and, being ex-military, recognised the fact that it hadn't been fired and was in fact still "live". A quick 'phone call too the police duly ensued and the bomb disposal squad took it away pretty sharpish. It had been 'cooking' by the fire for years and knocked over many times, but without the bang fortunately. It had been kept polished of course and my old cousin did miss it afterwards, as it had been a gift from her late brother.